In their sufferings, O Lord, Thy martyrs received imperishable crowns from Thee, our God; for, possessed of Thy might, they set at nought the tormenters and crushed the feeble audacity of the demons. Through their supplications, save Thou our souls. O instructor of Orthodoxy, teacher of piety and purity, beacon of all the world, divinely inspired adornment of monastics: O all-wise Stephen, by thy doctrines thou hast enlightened all: O harp of the Spirit, entreat Christ God, that our souls be saved. 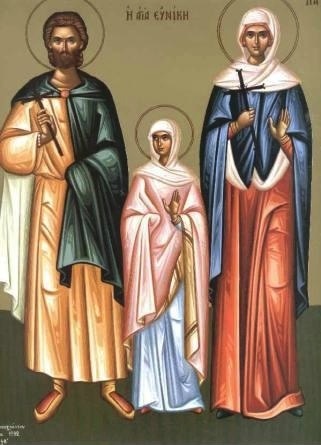 Today the honored memorial of the martyrs, Terence the all-wise and his company, hath arrived, bringing gladness to all; wherefore, let us receive healing, for they have received from the Holy Spirit the grace to heal the infirmities and pain of our souls. Thou didst plant a garden of the virtues and water it with the torrents of thy tears, O most glorious one. And having received the tree of life, O Stephen, save thy flock from corruption by thy supplications and deliver from evil circumstances those who fervently honor thee; for through faith and love, O wise one, we have acquired thee as an intercessor most great. Annual Parish Meeting will take place on November 11th, with a pre-fasting “Thanksgiving meal.” (Nativity Fast starting November 14th) Please sign up for making dishes! Please fill out your Pledge Forms and hand them in at or before the Annual Parish Meeting. Remember Daylight Savings Time next week! On November 1 the Church celebrates the memory of a pair of unmercenary physicians, Saints Cosmas and Damian of Asia Minor. There are two other pairs of unmercenary saints named Cosmas and Damian, one from Rome and celebrated on July 1, and the other from Arabia and celebrated on October 17. The word “unmercenary” means the same thing for all of them—that they refused payment for their healing work. 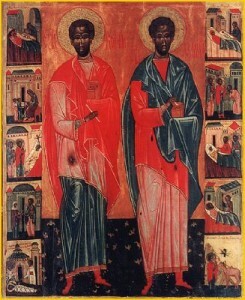 The two brothers celebrated on November 1 were raised by their mother Theodota, a Christian whose pagan husband died while the boys were still young. She taught them to be reverent toward God, and encouraged them to study hard to become skilled physicians. She, too, is a saint of the Church and is remembered on this day. As Cosmas and Damian grew into manhood, they became well-known for their care not only of people but of animals. In their view, all living creatures, being part of God’s creation, were worthy of loving care and medical help when it was needed. The brothers knew that their abilities were God’s gift, so they determined never to request any payment for what they did. They applied this principle not only to friends and people they knew well, but to any stranger who needed their assistance. The courteous attention they showed to every person reflected their mother’s Christian teaching, and brings to mind the words of Saint Paul that we read today: “Conduct yourselves wisely toward outsiders, making the most of the time. Let your speech always be gracious, seasoned with salt, so that you may know how to answer every one” (Colossians 4: 5-6). Paul was encouraging his readers to be effective in spreading the Gospel by being gracious in speech and behavior; Cosmas and Damian did so by representing Christ in their medical treatment, always accompanying it with prayer. Having agreed to be “unmercenary” in their work, the two men were more strongly bonded even than many brothers are. But the bond was broken, in a sad and curious way, for a period of several years. A very sick woman, deeply grateful to the brothers for having cured her, offered Damian the small gift she could afford: three eggs. She insisted that he accept them “in the name of the Life-Creating Trinity.” Damian felt that he could not refuse. God intervened by giving the power of speech to an animal the two physicians had once treated. The animal assured everyone that Damian had accepted the gift only out of respect for the name of God, and therefore they should not hesitate to bury him next to Cosmas. Happy and relieved, the people did so, and the two brothers were united once again.Cosmas was shocked by what seemed to be a breach of their agreement not to accept payment, and he declared, on his deathbed, that his brother must not be buried beside him as they had planned. When Damian died shortly after he did, a big problem arose: where should Damian be buried?